Isabella Stewart Gardner Museum (called Fenway Court during Isabella Stewart Gardner's lifetime) is a museum in the Fenway–Kenmore neighborhood of Boston, near the Back Bay Fens. It is not only a museum but also a beautiful garden that entertains and educates people through art performances and events. The museum offers daily free guided tours. 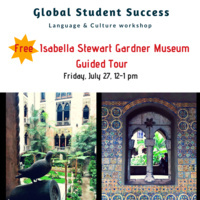 GSS invites you to join us in the tour (Introduction to the Gardner, 30 minutes) to enjoy the beauty of art and nature. After the tour, you'll have a chance to discuss your favorite piece of art in the group, or you’re welcome to continue exploring the museum on your own. Registration is required: https://neu.mywconline.net.